Air conditioning is not always feasible in large uninsulated spaces. In many parts of the tropical world traditional buildings are built with high ceilings and large windows to capture breezes. Because of size, air leakage, and the lack of insulation, these buildings would take enormous amounts of energy to air condition. In these climates, more modern apartment buildings are also being constructed, often of concrete with no insulation. If a bedroom contains a west facing concrete wall, the wall will be heated in the afternoon and this heat will flow to the interior 3 or 4 hours after sunset making sleep difficult. Air conditioning these spaces will be expensive and often unaffordable. To solve this problem we used a two-pronged approach. We incorporated task air conditioning and used a cot-like structure to increase exposure to cool air. 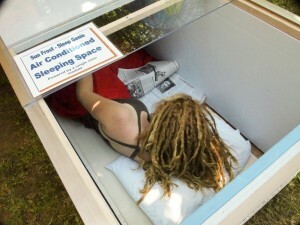 We constructed a sleeping space about 78 inches long, 34 inches wide, and 30 inches high. The space is insulated with one to two inches of foam insulation. A sliding acrylic panel above the occupant’s head gives the “Sleep Genie” an open feeling. The top half of the end panel folds down for easy access. A conventional mattress is an excellent insulator; as a result, loss of body heat in the downward direction is negligible. A cot or hammock used in many traditional cultures is a much more comfortable way to sleep in hot weather since heat and moisture can escape from above and below. One of our customers is currently setting up a Sleep Genie in southern India where nights are hot and humid and no electricity is available. This “Sleep Genie” incorporates a small DC compressor that draws only 75 watts and could be powered by a 12-volt battery charged by a single solar electric panel with an output less than 200 watts. 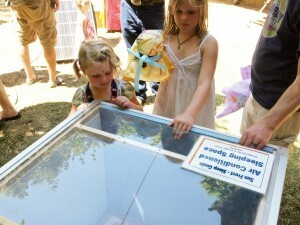 A 200-watt module is about 3.5 feet by 5 feet. In July at the Oregon Country Fair we powered a “Sleep Genie” with a single 165-watt solar module in 90ºF+ weather and the “Sleep Genie” kept the sleeping space at a chilly 65ºF. The cooling system on the “Sleep Genie” could easily be modified to run on utility power. As the world becomes hotter and energy more expensive we anticipate this technology will fill a definite need. Wow this is very interesting. This is the first time I have seen one of these things in action. How much do they sell for? The sleep genie could be adapted to animal crates and provide comfort to our working dogs while traveling in the back of the van or a pickup truck. What a great idea this is. There has been a trend towards zone systems which would only cool certain parts of the house. This makes perfect sense as to only cool a small section. That is really all that is required, also probably don’t want to be claustrophobic either. This would be perfect for a teardrop camping trailer.